Sell! (Consign) at our next event! 1. Need a JBF account? Sign up! 2. Register for the NYC event - it will pop up in your account profile. We are in this with you! Make sure to use us for support. These bite-sized Tagging videos are an easy place to start! up to 2x traditional consignment! ~ Team Members and Volunteers receive extra pay and shopping perks. by scoring some of the best deals of the season! or by check within 14 days after the close of sales. $10 taken from your sales after the event. and supplies for your first 10 items. *Please note, all fees are non-refundable. ~ You can sell all brands and all kid's sizes. There is no limit to the number of items you can sell AND you are not limited to just clothing; we accept toys, books, baby gear. In fact, we accept just about anything, it was easier to make a list of what we cannot accept. Check it out in the "Prepping for the Sale" further on down. ~ Prices (tags) can be made year-round. ~ You can tag on your phone and also use the talk to text feature. Feels like having a personal assistant! ~ You do not have to stay at the sale to sell unless you WANT to volunteer or join staff. We would love to have you. Anything you would like to pick back up will be sorted and waiting for you. ~ YOU CAN DONATE whatever you like to charity. How? While pricing, you just mark any item for donation. At the end of the sale, we gather those items and send them to charities that work closely with parents + children. If you would like a tax letter for your donations, just let us know and we will send your request to the charity. Shoppers that come to the sale, come to stock up! This is a great resource for families to buy for the season AND a great way for you to sell to hundreds of people without having to lose time messaging back and forth, coordinating meetups and dealing with no shows. By selling, you help others find what they need. By shopping, they help you in turn. Whatever doesn't sell, can go to charity and reach even more families and children here in the city. Click here for a short walk-through of what this all looks like. After you sign up for JBF, click on the "tagging" icon near the top right of your profile. This is where you will make your price tags. Use the "Checklist" section below as a reference for items you should have ready when you come to check in at the event. Check out the Prepping section below for reccomendations on pricing, how to videos, shopping links for supplies. JOIN our Consignor Group on FB! This closed group is a great place to ask questions and search topics. And PLEASE do not hesitate to contact us for any help. Just reach out! Join us for some of the best deals of the season. What can I sell? How do I tag it? What is tagging anyway? FB Consignor Group - Support when you need it! This video gives a great overview of what you'll need. Amazon has been a great online source for our supply needs. Check your local Dollar Store. Where does quality matter? Safety pins and clear packing tape! We get asked about these often. We can also help you out. Check out this post on Facebook. FAQ Can I use off-white or grey cardstock? We ask that you only use white. The other colors will give shoppers the feeling that the tag has aged and that your item isn't as fresh as it is. It will feel old. If you just bought an off-white or grey color and cannot return it; use it for crafts for the kids and call us. If you need help printing - we are happy to print tags for you after you have entered everything - no charge! Just catch us early enough before the event (a week or more) otherwise time gets a little tight for us. Wire, retail + tube hangers are all just fine. Here are some ideas about where to snag hangers. We have also seen them online at big box stores as low as $13 per 100 for tubed, child-sized. If you have problems finding them, we got you! We do offer them at cost for 10-12 cents a piece. They will be available at our office or at the venue during our setup. Just contact Shannon to arrange for pickup and payment. The most successful JBF Consignors practice Shopper-Focused pricing. Simply Ask "What price would make me buy this item without hesitation.... and tell my friends to go RUN to the sale?" Here are a few resources you can use. We also have pricing tips in each category type in the pink links below. Pricing Guide; Keep it simple This guide is a great way to keep pricing simple, so you can price quickly. Pricing Guide; Detailed! This is a very detailed pricing guide. This is great for spot checking your pricing or if you want to check on a particular item. Keep in mind that this was written as general guideline. There are ways to make it more specific to NYC. Simplify pricing with this great video by Consignment Mommies. We whole-heartedly support the info she shares and find it to be true! There is also a good Q+A in there, but you can easily skip through if necessary. For Items like baby gear; go to ebay and check "sold listings" (bottom left of page). See what prices items actually sell at. Parent FB or Yahoo groups. Online Upcycle Stores - great for checking on specific brands: swap.com. Do you want to stop and check for every single item against the detailed pricing guide? NO. You will get exhausted. We suggest using the simple guide above and then for gear and other items, do a quick check online. Always undercut what you see on ebay and other upcycle sites. Parents have been shopping around. Can you imagine, standing in front of an item, for which you don't have to ask any questions (because you can see it in person), wait to receive in the mail or pay for shipping. AND it's less expensive?! Parents come WANTING to stock up. To find as much as they can for this next stage or season for their child. I am one of those parents (Shannon Arias here)! Mauricio and I LOVE being able to shop and find as much for our little one as possible. Remember, YOU ARE an expert. You are selling to moms + dads just like yourself! Pricing high. You make more if you sell more! Remember, your items will be next to someone else's, so price competitively. Keeping Items at Full Price. Our sale has full price AND 50% off days, so you are missing out on much of that shopper traffic by leaving your items at full price. Most shoppers on these discount days are specifically looking only for items that are half-off. Pricing high when items are marked to "reduce". You WANT your items to sell at Full Price! NOTE: Check your REDUCE and DONATE settings in your tagging account to fit your preferences. We have seen it! A consignor prices high, keeps everything full price and then sells very little - having a lot to come pick back up. Better to sell a ton and let the rest support charity! We LOVE writing big checks to send to our consignors and want you to have a great return for your time and effort. Unsold items that sit back at home or in storage can also become damaged by turning color. They take up valuable space at home or cost to store. Enjoy clearing it all out at once, making the most that you can and the peace of mind that comes from knowing ALL of your gently-used items can find a new home. This all said...if you have something special or useful you would like to save or give to a friend, by all means do so! It is totally up to you. We order from Store Supply. They usually ship fast and, we find, work well. You can also find on ebay and amazon. Note: They can be cheaper (especially ebay) but check the seller rating and also pay attention to shipping ETA. Sometimes they ship out from overseas and take quite a while to arrive. Tagging guns are extremely handy and fast but can damage fabric if not used properly. Because of this, we cannot accept items improperly tagged with tagging guns. Scared you off these nifty tools? We sure hope not! If you have a lot of clothing, they can be such lifesavers. Just grab a few old washclothes or old pieces of clothing for practice. Or call us and if we can, we'll set up a free tutorial (aka coffee near our office :). When tagging - be careful to tag only on the clothing label, when visible (at the neck of a shirt or waistband of pants, skirts, etc.) or using an inside seam that allows the tag to hang where it is easily seen (from the top if possible). Also, pull on the tag to make sure it is properly secured and will not come off easily. You can place tape over the barb and tag to ensure the tag stays on. 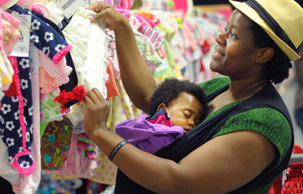 JBF accepts just about anything baby to teen. There are some things we cannot accept, however, due to safety concerns, licensing and the promise we make to parents, there are some things we cannot accept. Please refer to the list below of what we cannot accept and our requirements for condition. If you are in doubt, do not hesitate to reach out to us for guidance. clean, odor free, smoke free, pet hair free. Clothing should be recently washed and fluffed or pressed. No rumpled clothing please. Parents envision their infant in that bouncy seat or onesie and it makes a difference as to whether they buy it. Much of this is fixable ahead of time, but if it comes to the sale, we cannot allow it on the floor. Recalled Items without the repair kit from the manufacturer installed. Items that don’t meet current safety guidelines check out our Recall + Safety tools... link here and at bottom of page (in the pink circle). Single-User Breast Pumps. (Hospital/Multi-User pumps are okay). Adult clothing, unless it’s maternity. Out of season clothing sizes 3T - Junior 18. (All-Season clothing is ok... rain gear, for example). Hand crafted items (because of safety guidelines). items with missing pieces or that are broken. Items that are not clean. For example, infant gear with dried or car seat with stains/crumbs. Note: Batteries should be included in all things battery operated. They should work to enough to demonstrate that the item works but do not need to be new. Damaged clothing: torn, snagged, stains, broken zipper, missing buttons, showing excessive wear (frays and pillage) etc. Clothes improperly tagged with a tagging gun (because it will damage the fabric). Clothes that are not clean, are rumpled, smell musty, of smoke or that have pet hair. This is currently a very limited category to women's accessories/goods and home goods. No shoes, clothing, or fine jewelry (precious metals/stones. No open product. Everything must be in truly gently used condition or better. Thank you for helping us to create a wonderful resource for NYC parents! Diaper bags, infant carriers, backpacks, and purses are great consignment items. Please inspect all carefully to make sure items have not been recalled (link), stained, damaged or are missing pieces. Books, book sets, board games, puzzles, video games, video game systems, scrapbook, arts & crafts sets are great items for resale. Please only bring kids’, parenting, homeschooling, pregnancy and child rearing books. Games and puzzles must have all pieces. (No "adult" content please). Check items to ensure they are in great condition. Package: Use clear, self-seal bags or clear cling wrap (saran wrap) to hold multiple items together; Tie sets of books together with ribbon/string. Be sure that parts/games to video game systems (such as Vtech) cannot be separated or switched out at the sale. Video games will be near checkout to prevent theft. We sell children's clothing Newborn through size junior size 18 as well as maternity sizes. Our Spring Sale is spring & summer clothing only. Be picky. Look at your clothing as if you were going to purchase them. No stained or damaged items will be accepted. Please freshly clean your clothing items. Replace missing buttons, sew loose hems and seams, and clip loose threads. Please button all buttons, snap all snaps, zip all zippers before you arrive at drop off. This will ensure that there are no defects in the clothing. The newer the item looks (and the better it smells), the better it will sell. Package & Hang: Hangers - Please hang clothes so the hanger hook points to the left (like a question mark). Hang size 0-6 clothing on child-size hangers and sizes 7-18 and maternity clothing on adult-size hangers. Clothing that falls off the hanger onto the floor does not sell well. Old Navy and many outlet stores are great places to get free hangers (they throw away hangers daily!) and WalMart & Target sell child-size plastic tube hangers at a great price. Clothing Sets - Sets tend to sell better (under size 6) so match things up if you can. All garments should be hung with the hanger hook pointing left (should resemble a question mark when looking at the front of item). Safety pin to attach clothing sets securely with bottom garment hung on the backside of the shirt, so both pieces can be viewed without separating them. Pants/Shorts - Pant-clip hangers are great but if you use a standard hanger, simply use safety pins to attach pants to the top part of the hanger so the garment will not slide. Onesies and socks need to be in a clear zip-loc bag (you may grop multiple items in one bag). Please be sure to label your tag well so that customers know if the items are short-sleeve onesies or long-sleeve onesies. Price: Hanging Clothing - We suggest (but it is not required) to put outfits/set together and price for at least $3.00; Start at $3 for basic, generic brand 0-24mo outfit. Add $1 each for larger size, name brand, formal, and heavy/winter. Non-hanging Clothing - Put sets together to price for at least $3.00, but okay to price for less (i.e., 6 pair of socks for $1.50). Package: If item has multiple pieces use packing tape, zip-ties, or string to keep items attached together. If wooden furniture has loose parts, use clear plastic wrap to secure item. All furniture and equipment must be assembled during the sale. Batteries must be included, if applicable. Please bring a Car Seat Checklist (link) for all car seats, booster seats, and car seat base or infant carrier. Women's accessories/goods (costume jewelry, sealed product, scarves ...) + Home goods that other families will use (no knick knacks please). In line with the rest of the event, these items must be in gently used or better condition. Regarding Women's Accessories: We cannot accept fine jewelry (precious metals + stones) open product, shoes, women's clothing. No Knock offs. You may consign storage solutions (baskets, bin, shelving), furniture, decor (lamps, wall hangings, no antiques), and kitchen items (small appliances, utensils, etc.). Re Non-child specific furniture; please be selective with large items for this fall 2016 sale. Our space for this event is limited. If you have questions, just call us to consult. Price: Price to sell! These items are not the primary reason shoppers come to JBF, so price them low! Make sure shoes are clean, clean, clean! We will be VERY selective during Consignor Drop Off & Inspection. Shoes must be current season (Fall = October thru March; Spring = April thru October). Package: Fasten shoes together with zip ties. For infant shoes or small shoes without laces, you may put them in a clear zip-lock bag. We prefer no shoe boxes. However, if shoes are in the box, please remove the lid, secure it to the bottom of the box, and secure the shoes to the box (closed boxes do not sell well). Price: We suggest to start at $3.00 for infant/toddler; Add $1 each for larger size, name brand, or heavy/winter. 2. Registration Cost - $15. $5 deposit paid before the event, $10 taken from your sales after the event. 4. Bring Waivers and State or Federal Picture ID to Dropoff. 5. Bring that same picture ID back for Pickup. 6. Donation letters (for tax documentation) are given upon request. - Spring/Summer clothing + accessories only. fall/winter specific in style (e.g.. flannel, thermal). - All-Season items like rain gear, are fine. - Sizes preemie - 2T can be ANY season. For NYC - instead of the button there to the right, contact shannonarias@jbfsale.com if interested. We look forward to hearing from you! We really do. Come alongside us to support a worthy cause, meet other parents and make/save extra money! Our team is composed of volunteer + paid positions. Paid Team Members receive $10.50/hr, are scheduled anywhere between 6 - 40 hours during the course of the event (based on your availability) and are given a tax record at the end of the year. Help out with areas of the event that directly benefit our charity. Volunteers help out for 2 hours or more throughout the event and are given awesome discounts off their shopping and are also invited to the Team Member Presale. Mauricio and I just want to take the opportunity here to say thank you! Please know that we are so grateful to have you come together with us to make this happen for our families. If you are new to tagging- we encourage you to give it a try! We are here to help you get started with workshops and personal consultation. No time to tag? There might be someone in your circle who is willing to help! Ask a babysitter or another mom who is saving up extra $$. We're here to support them as well, just make sure to send us there name after you sign up!